Shared value creation is not another name for corporate social responsibility (CSR). While some overlap exists, the clear distinction between the two is that shared value programs emerge from core business operations and strategy, whereas CSR is typically an ‘add-on’ feature, originally developed for public relations purposes. In some ways, shared value represents a return to the original purpose of business – to serve a community’s needs. 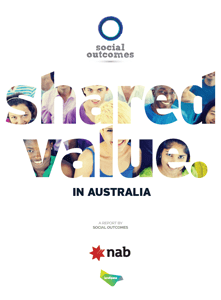 In July 2015, Social Outcomes released Shared Value in Australia, the first report of its kind in Australia. The report explores the opportunity that shared value creation presents to Australian businesses, drawing on dozens of interviews and lessons from pioneers across the country, and globally. National Australia Bank (NAB) is exploring shared value in the areas of: reduced finance rates for renewable energy assets; no and low interest loans; impact investing; and Indigenous business. Lendlease partnered with the Leukaemia Foundation, Westpac and the Royal Brisbane Women’s Hospital to create co-located accommodation for doctors, nurses, students, and families of patients with leukaemia. The Shared Value Project is the peak practice body for shared value in Australasia, and the regional partner of the global Shared Value Initiative. Hewlett Packard: with its ambitious goals to reduce its total carbon footprint 20% by 2020. IKEA, ‘Better Shelter’: Sadly, the need for crisis accommodation across the globe continues unabated. The 2015 April and May earthquakes in Nepal left hundreds of thousands of people without shelter. In Syria, over four million refugees have fled the country since 2011, with U.N. High Commissioner for Refugees, António Guterres, calling it “the biggest humanitarian emergency of our era.” With this continued need in mind, international furnishings company, IKEA, famous for its flat-packed products, partnered with UN Refugee Agency (UNHCR) to create shelters for refugee families. Through the production of these shelters, IKEA identified a critical product market gap, with an enormous potential for social impact. The shelters are indeed flat-packed, and can accommodate five people. They are equipped with a solar panel that powers an internal lamp and a mobile phone charger, and walls are built from custom designed plastic foam that provides thermal insulation and protection from the weather, which traditional canvas tents have not been able to do. The shelters, which last around three years (compared to an average of six months for traditional tents), cost around US$1,150 each. While the cost is double that of the traditional tents, they are considered more cost-efficient given their longevity, as well as protection from the elements, which can threaten knock-on costs associated with impacts on refugee health. Immediately after the innovation was launched in March 2015, UNHCR purchased an order of 10,000 shelters, generating around US$11.5 million in sales for IKEA. Interface: the world’s largest manufacturer of modular carpet, has initiated several internationally renowned shared value programs. For instance, its ‘War on Waste’ initiative has converted over 100,000 tons of potential landfill into new carpet tiles. Interface also launched Australia’s first 100% recycled nylon yarn carpet tile, ‘Raw’, as well as Australia’s first environmental Product Declaration to help consumers choose the most sustainable carpet tile. One of Interface’s most unique programs is called ‘Net-Works.’ Net-Works partners with fishing communities in developing countries to collect massive volumes of discarded fishing nets, which otherwise inflict widespread damage to coral reefs and marine life. The fishing community collects and cleans the nets, and then sells them back to Net-Works, via community banking groups. The nets are then transferred to one of Interface’s yarn suppliers, Aquafil, who recycles the fishing nets into post-consumer nylon yarn for carpets. The recycled yarn, ‘Nylon-6’ performs exactly as virgin raw material would. To date, over 41 thousand kilograms of nets have been collected from partner fishing communities in the Philippines, enough to wrap around the circumference of the planet. Watch a short video on the Net-Works program below. M-Pesa: The mobile money transfer service launched by Vodafone’s M-Pesa program, now benefits over 18 million customers in Kenya alone. Initially a partnership between the UK’s Department for International Development (DFID) and Vodafone, M-Pesa was born out of an entrepreneurial interest in the fact that millions of consumers in East Africa were transferring mobile phone credit to their friends and family. M-Pesa was an innovative next step to provide millions of people in Kenya, and now dozens of other countries, with the ability to possess a ‘virtual wallet.’ The service provided a financial inclusion tool for millions of people, many who, for the first time in their lives, could now save money, smooth out their saving and spending rates to protect them against income fluctuations, and conduct transactions that are faster, speedier, and safer than travelling long distances to traditional brick and mortar branches for cash. Both banks and telecommunication companies benefit since they can tap into a large market of users, and reduce customer churn. In developing countries, it is estimated that 20% of annual costs to banks are connected to the onboarding of new customers. Access to M-Pesa encourages customers to stay attached to telecommunications and banking companies, who realise around$2 to $6 of profit per M-Pesa user, as a result of increased customer loyalty. As more banking services are provided virtually, banks also benefit from reducing the cost of branches, as well as printed statements, which cost around $9 per person/per year (SMS statements cost around $1) (Gates Foundation, 2013). Several organisations, like the Bill and Melinda Gates Foundation, are now looking at innovative ways to expand the types of services available through these platforms, so that an individual’s mobile phone can also be used for micro-insurance, micro-loans, paying school and health fees, and much more. Unilever: Multinational conglomerate Unilever employs over 174,000 people across the globe, and generated sales of over A$73 billion in 2013. Every week, over two billion customers use one of Unilever’s products, including household names like Dove, Rexona, Surf, Omo, Lipton, Flora, and Vaseline.Unilever has emerged as a leader in shared value creation, having developed several impactful and innovative programs. For example, ‘LifeBuoy’ soap (video below) is designed to increase handwashing among one billion people in Africa, Latin America, and Asia. The handwash changes colour in ten seconds, (the amount of time it takes to protect against 99.9% of germs), making handwashing effective, but also fun for children. According to one study on LifeBuoy in India, increasing handwashing led to a 25% reduction in diarrhoea, a 15% reduction in acute respiratory infections, and a 46% reduction in eye infections. Lifebuoy also runs the world’s largest hygiene promotion program, aiming to improve the handwashing behaviour of a billion people by 2020. Unilever partners with numerous NGOs for the program’s implementation, including Population Services International, UNICEF, and Water & Sanitation for the Urban Poor. “Lifebuoy is a good example of how brands that help to address social challenges can drive business growth. It has achieved three years of sequential double-digit growth to become the world’s number one antibacterial brand” (Unilever, 2015).